This girl has raced in NSW Hunter and Northern Rivers area. She seems to do her best work just sitting off the pace. She has had 10 top 5 finishes with 5 placings and she last raced on the 13th January. She has come so close to breaking her maiden win, and if you drop her back a grade, you will see a quick return! INTERGAZE (AUS) (1993). 12 wins-2 at 2, VRC Australian Cup, Gr.1. Sire of 335 rnrs, 192 wnrs, inc. SW Maybe Better (MRC Coongy H., Gr.3), Sir Sensible, Gaze On, etc. Sire of the dams of 81 rnrs, 52 wnrs, inc. SW Single Gaze, Le Val, SP Belzella and of Lady Hawke, Another Bullseye, Curata Princess, He's Applz, Oloroso, Master of Darkness, Ricci Royal, Sugar Free, Class Clown, Beluga Miss, Applying, Checonsul, Clever Fortune, Preen Queen, etc. Solar Storm (f by Intergaze) See below. 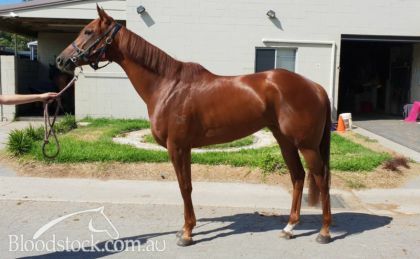 Cyclone Jack (g by Fiery Match) Placed in Aust. Majin Buu. 2 wins at 1200m, HKJC Tianjin H., 2d HKJC Philadelphia H., Salisbury H., Wong Shek H., Pedder H., San Francisco H., 3d ARC Waikato Times 3YO S., HKJC Sha Tin Heights H., Pilkem H., Wo Che H., HKU Foundation H.
Foxy Babe. 3 wins to 1250m in Aust. Your Boss. 2 wins at 1600m, 1900m in Aust. Cyclone Babe. Winner. See above. Pockets (c Marscay) 3 wins at 2, A$558,480, STC William Inglis Classic (c&g), AJC Harry Plant H., STC Clarins H., 2d STC Skyline S., Gr.3, AJC HC Dangar Welter H., STC Truscotts Welter H.
Bolt Action. 8 wins to 1400m in Aust. Fashion Babe. 2 wins. See above. Aussie Jack. 7 wins from 1050m to 1600m, A$165,915, to 2018-19, 2d SAJC Sth Adelaide Football Club H., 3d GCTC Racelandia H.
Luscombe Star. 2 wins at 1000m, 1100m, 3d BATC Tefal Cookware H. Producer. Whinker. Winner at 1400m in Aust. Producer. Kidmar - Oriental Akai (Mac.). 3 wins-1 at 2-from 1100m to 1800m in Aust. and Macau, Macau Derby Trial H., Macau Derby, AJC FC Griffiths 2YO H., 2d VATC Mona 2YO H., QTC St Margaret's H., Morgan Stockbroking H., BTC Neilsons H., MVRC Leica Show 2YO H., 3d Qld Tatt's RC VB 2YO H., STC Euclase 2YO H., BTC Inghams H.
Kerri Anne's Girl. 2 wins at 1350m, 1400m, BTC Brisbane South H.
Chicken Bob. 4 wins-1 at 2-to 1500m, 3d BTC Carlton Draught H., QTC Lyndhurst Stud H.
It's a Babe. 4 wins to 1500m, 2d AJC Complete Signs H. Producer. Da Vinci's Legacy (c Peintre Celebre) 4 wins-1 at 2-at 1400m, R297,720, Vaal Computaform Express H., Computaform Rating H., 3d Newmarket Storm Bird S., L, Vaal Racing Express H.
Stealing. 7 wins from 1200m to 1900m, STC Strathfield H., 2d AJC Bank Holiday H., STC St Leonards H., 3d AJC Peter Lawson H.
Steal a Babe. 2 wins. See above. ELKALYN (f The Elk) 8 wins. See above. CAFETERIA (f Lunchtime) 15 wins-5 at 2-from 1000m to 1600m, A$128,735, TTC Gold Sovereign S., L, TRC Fosters Classic, L.
RICH ENUFF (c Written Tycoon) 3 wins at 1200m, 1400m, A$574,450, VRC Danehill S., Gr.2, MRC Caulfield Guineas Prelude, Gr.3, MVRC Mitchell McKenzie S., L, 2d MRC Caulfield Guineas, Gr.1, Heath S., Gr.3, 3d ATC Southern Cross S., Gr.3, MVRC Friends of Epworth 2YO H.
TSHAHITSI (g Clangalang) 12 wins from 1000m to 1600m, A$427,025, to 2017-18, VRC Winter Championship Final H., L, MRC John Dillon S., L.
JAM CITY (c Scrupules) 8 wins from 1200m to 2400m, A$137,910, TRC Hobart Cup, Gr.3, VRC Star of the Realm H., MVRC Craigieburn H., 2d VATC Polio Eradication H.
Race Record: Placed to 2017-18 in Aust. 05/Feb/2016 4th of 8 --trial--Gosford RC Barrier Trial, 800m. It's So Obvious was 1st and For Guydance 2nd and Fantasy Fair 3rd. (7.5) Coff's Harbour RC Coffs Toyota & Pier Hotel Maiden H., A$21,560, 1300m, time 1:18.73. Track good(3). Carried 54.00kg. Atyaaf was 1st and Materiality 2nd and Private Client 3rd. Trainer: W J Gavenlock. Owner: Mrs S J Gavenlock. Jockey: S Traecey.